The fells of Hindscarth and Robinson, viewed from near the summit of High Spy in Cumbria. 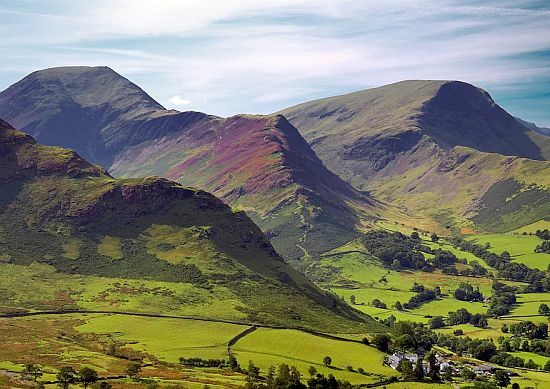 This past week, it was announced that the Lake District in north-west England has been designated as the UK’s first world heritage national park. As someone who has tramped the fells, and revelled in the scenery, I am pleased, but not all are. For example, George Monbiot suggests that the designation protects sheep farming, it’s new status is a betrayal of the living world, and nothing else. Yes, it is true that sheep have overgrazed the land, nibble at new growth, and there is a need for a mixed usage of the land, with sensitive rewooding. I said as much last year when my chosen image was of Ennerdale, the area of the Lake District I am most familiar with. But I chose the photo above because it reminds me how much I miss landscape painting. A larger version of the above image, and several ,more can be found here. Last Saturday, and too late for my Image of the Week, the Guardian published a list of twenty country walks with a pub somewhere en route. …. before having a pint in the Beachy Head Inn. Although that was a noteworthy occasion, during my regular breaks from university life, and when I didn’t have to go to my holiday workplace, I’d go for a day’s walking over the South Downs …. … and have a lunchtime pint at somewhere like this village pub in Alciston. From mid-1976 to the end of 1979, I lived in West Cumbria, the flattish coastal plain to the west of the area known as the Lake District for a fairly obvious reason. These lakes nestle among England’s highest mountains, which are miniscule compared to the Himalayas, but still offer great walking along the ridges. I wrote about Ennerdale Bridge recently, so rather than repeating myself, here are some more photos. The Wasdale Head Inn was a welcome sight, both before and especially after climbing the Great Gable or Scafell Pike, and not just because it had draft Theakston’s Old Peculiar. I had a CZ trials bike at that time, and always enjoyed zooming around the countryside. The car park was a bonus. This is a photo of a ‘Strawberry Moon’ over the ancient stone circle of Stonehenge on Salisbury Plain in south-west England. It was presumably taken on June 20th, or thereabouts, in 1967. I know that because this article alerted readers to the one ‘scheduled’ for Monday evening. It is significant because it only happens at the most twice in one’s lifetime, at 47 years intervals. The strawberry moon solstice is when the lightest (i.e. longest) day of the year in the northern hemisphere coincides with a full moon falling. In June 1967 I was working a twelve-hour night shift in the Bird’s Eye frozen foods factory, in the Dairy Cream Cake and Chocolate Éclair section, earning enough to support myself the following month as I started my teaching career. I don’t recall any skylights. Maybe I should have popped up on my roof here in Jakarta this time, but I was intent on watching the final episodes of Penny Dreadful, a must-watch again on DVD series which out-hammered the Hammer Horror films. In 1969 I moved into a flat in London which was rented by a schoolmate of Robert Wyatt, and thus was introduced to the ‘Canterbury Scene’ a loose network of musicians from the cathedrar town of … erm … Canterbury, one that continues to this day. Robert was then the singing drummer of The Soft Machine who had supported Jimi Hendrix during his first tour of the USA. At the conclusion of that your, Hendrix let Robert use his studio to work on some demo recordings, which only surfaced as ’68 in 2013. One of the four tracks became a perennial favourite and in 1970 was to take up the third side of the third Soft Machine album, a double album called, imaginatively, Third. One member of the extended Canterbury Scene family of fans is friend Leonardo Pavkovic who runs a record label out of New York. He manages the Soft Machine Legacy and releases their recordings, as well as those of a number of Indonesia’s jazz and jazz-prog-rock artists. The name of his label is MoonJune Records. BTW. If you want images of last Monday’s Strawberry Moon, click here. The Guardian has a series of ‘great country walks‘, and this one in the Lake District of north-west England stirs very favourable nostalgia: been there, done that. It is now set as my computer background so while I vegetate facing the screen, I can dream. I’m the only non-Indonesian living in my street, the sole survivor where once there were many. One of them was Martin Westlake, but although we lived almost opposite each other with our Indonesian families we didn’t socialise, but sometimes met while observing the election process at the booth blocking off our end of the street. There was a sign of his front gate announcing Jankung Fotografi, an indication that we had, and presumably still have, stork-like physiques. What is not in doubt though is that he has continued as a photographer, and you can see much of his portfolio here.